One of my favorite things about hosting The Heavy Petting Zoo is having the opportunity to introduce perfect strangers to fabulous artists they may not have gotten to know before. And I always take great pleasure in bringing the smooth baritone sounds of Johnny Hartman to you nearly every week. His voice is the perfect backdrop to a cozy Saturday night. I often wonder– if not for my chance discovery of Hartman upon the recommendation of a friend, where else might I have heard him? I’m not convinced I would have! It’s not uncommon for me to get the ol’ *blink blink* reaction when I mention his name in conversation. In fact, the only person I know who recognized it at first mention was the wife of WSUM’s General Manager. She’d seen The Bridges of Madison County, where Hartman is featured prominently in the soundtrack. When a singer or songwriter goes under-appreciated, I tend to blame society and its questionable taste in music. With Hartman, this approach won’t do. He never had much of a chance to become well known in the first place. For this, we can mostly blame the record labels… and bad timing. Hartman’s first forays into singing were at his Chicago church choir — the same choir, in fact, as Ruth Lee Jones. Or, as we know her, Dinah Washington. He polished his voice through singing lessons and involvement in the school glee club. He also honed his craft by studying the sounds of Billy Eckstine, Frank Sinatra, and Nat King Cole. His career got a jolt when he won the chance to sing with Earl Hines and His Orchestra as a teenager. When you hear Johnny Hartman on The Zoo, chances are he’ll be singing a ballad. This was his specialty and his preference. According to biographers*, he loved love songs. The reason he’s a favorite on this show is because he knew how to deliver love songs with authenticity– saccharine-free– his rich voice hitting notes you never knew could resonate that way before. A composer friend of mine once taught me this lesson, and it ruined the musical RENT for me. Nevertheless, I keep it in mind as a measurement for quality and true musicianship. I always thought of Hartman as a great “gateway jazz singer.” That is, if you’re not into jazz, listen to this guy just to get your toes wet. Not all of his songs are jazzy, but a good number of them leave you clasping for a glass of bourbon and imagining yourself tucked into a smoky** corner of the Blue Note. But Johnny Hartman aspired to be an “all-around singer.” Not just a “crooner.” And certainly not a “jazz singer” (whoops). To be a “jazz singer” at the time would mean being painted into a corner, so to speak. You wouldn’t be hired for gigs at the major hotel ballrooms, supper clubs, and nightclubs. And those were exactly the things Hartman wanted. Despite his aspirations, Hartman’s career saw another fate, and along the way, he ironically found himself recording alongside one of the biggest jazz greats of all time. 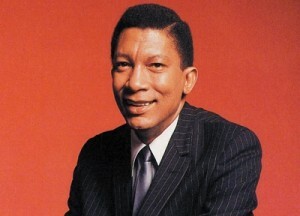 To my knowledge, Johnny Hartman is the only vocalist ever to have recorded with John Coltrane. Their collaboration turned into the album known simply as John Coltrane and Johnny Hartman. Amazingly, it was recorded in a single session on March 7, 1963. It turned out Coltrane already knew the song itself, so putting it on tape was a matter of tracking down the lyrics. Once they did, they recorded the track in a single take. Just one take! Of all the artists featured on The Zoo, Johnny Hartman is the only one I listen to and actively mourn the fact that more people haven’t had the chance to get to know him. I’ve long wondered why his wasn’t a household name alongside other vocalists of his time. Hoping to ride the coattails of Nat King Cole and Billy Eckstine, two African Americans who’d already made it into the mainstream, Hartman signed with the RCA label in 1951. They committed to Hartman for one year and 16 songs*. Among those songs: “Wheel Of Fortune,” recorded on August 6, 1951. Unfortunately, Kay Starr’s recording of that same song (by Capitol Records) wasn’t too far behind. When it was released in February 1952, it became a major hit and overshadowed that of Hartman’s. Some blame RCA for the failure, alleging it could have done more to promote Hartman before Starr had a chance to outshine him. A number of missteps by RCA and others in charge of managing Hartman’s career have been blamed for the fact that he remained relatively unnoticed in the grand scheme of American music history. He was more popular in Australia than he was here. A personal observation: It took a heckuva lot of research to find sufficient information on Hartman before I could bring you this article. Even the so-called ‘definitive’ reference books overlook him. It’s never too late to get to know Johnny Hartman and explore his music. Among his other RCA tracks were “Out of the Night” and the catchy “Worry Bird.” Both are available on an excellent compilation called The Johnny Hartman Collection (1947-1972). It’s a great way to scratch the surface of Hartman’s career without diving deeply into any one album. 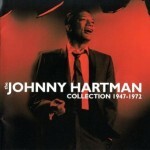 If it weren’t for word of mouth, I would never have known to bring Johnny Hartman to you. I hope you’ll spread the word about him and keep this ‘wheel of fortune’ spinning ’round and around! ** You can’t smoke at the Blue Note in New York City anymore, for what it’s worth.